If you missed the trailer, then don’t worry as you can find it over here. This time we have been sent over the newest poster. What can these brave actors do to try and get America to join the war on the side of the British? Will the film that they are making tug the heart strings enough to make then join? Only time may tell! 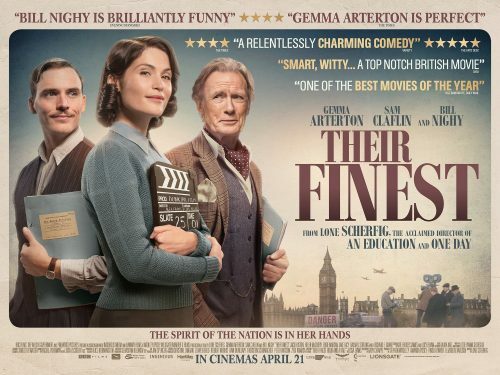 THEIR FINEST, based on Lissa Evans’ novel, ‘Their Finest Hour and a Half’, is a witty, romantic and moving portrayal of a young woman finding her way, and her voice, in the mayhem of war… and the movies. 1940, London, the Blitz; with the country’s morale at stake, Catrin, an untried screenwriter, and a makeshift cast and crew, work under fire to make a film to lift the nation’s flagging spirits; and inspire America to join the war. Partnered with fellow writer, Buckley, the pair, along with fading matinee idol Ambrose Hilliard, reluctantly joins forces on a movie to warm the hearts of the nation and capture the imagination of the US public.